Last week during my break, I watched 'The Blind Side' on TV. Again. I have seen this movie more than five times and I fall in love with it every time I watch it. This is the movie that won Sandra Bullock her Oscar and it was so rightly deserved. There is not a dull moment in the movie and every character is so perfectly cast. The plot is neat, tight and quick. And most importantly it touches your heart like nothing else has ever done. It leaves you feeling happy thinking that the world actually is a nice place. For those who have not seen it yet, please watch it as soon as you can. 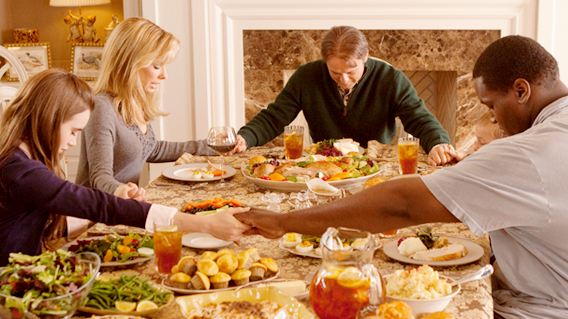 Released in 2009, The Blind Side is the story of Michael Oher aka Big Mike who has been living in a foster care with different families. He has a troubled childhood with a drug addict mother and a runaway father. He has a poor academic record but is good at athletics thanks to his big size. Burt Cotton, the coach of Wingate Christian School takes him into the school thanks to the reference of Michael's father's friend. But Michael is not what he seems to be. Although big and put into the football team, he has no idea about the game. Michael is soon befriended by Sean Jr Tuohy who is called S.J. S.J's mother Leigh Anne Tuohy notices her son's new friend and finds him walking alone on the street one cold night. Leigh Ann takes him in for the night but soon realizes that Micheal is very troubled and lonely. One night soon turns into a long time as Michael begins to live with the Tuohy family. Leigh Ann becomes his legal guardian and helps him in academics and even teaches him how to play foot ball knowing that he scored 98 percentile in protective instincts. She helps him with the game keeping only this mind. Micheal learns to play brilliantly and is soon a champ at the game. When he gets a chance to play at university level, many schools come forward to take him in. Ole Miss is the alma-mater of the Tuohys' and they are happy when Micheal decides to join Ole Miss. An investigation follows to look into whether Michael was influenced by the Tuohys or Miss Sue, his tutor to benefit their alma mater. They suspect that the Tuohys' took in Micheal only so that they could help Ole Miss. Micheal is not happy when he learns of this. He suddenly begins to question why were the Tuohys' so kind to him in the first place. 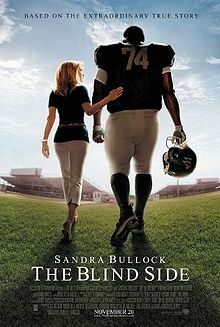 This film is based on a book The Blind Side: Evolution of a Game by Michael Lewis and is indeed an incredible true story. The story is simple and straight forward with no unnecessary drama. The screenplay is tight and doesn't dip even at a point. Sandra Bullock as Leigh Anne Tuohy, a rich interior designer comes across as uptight and arrogant at first. But she is anything but that. The concern that she shows for Micheal is so genuine and I love the scene when she argues with her friends regarding her decision to take him in. She is emotional, but doesn't show it. Like her husband says, she's an onion and needs to be peeled to look inside her. Micheal sees this and loves her for it. The entire family accepts him with an open heart and it is so wonderful to see the relationship they all share with Micheal. Not once do they treat him badly or hint at the fact that he is not actually a part of their family. S.J's relationship with Micheal is really sweet. S.J is pint sized and is not intimidated by Micheal's size and takes it upon himself to help Micheal choose the right school. His negotiations with the coaches of various universities bring a smile to your face. The scene on the field when Leigh Anne calls Micheal aka number 74 as her son, and when Michael calls her "Mama" for the first time, does bring a tear to the eye. The movie closes with the real life footage of Micheal Oher and his success as a football player. This movie rates 7.7 on IMDB, but is a 10 for me. I haven't felt this way about a movie since 'The Pursuit Of Happyness'. Do yourselves a favor. Go watch it now. I will definitely watch it now! Oh yeah, she's so awesome in this.